The National Competitiveness Council (NCC) is optimistic towards attaining Philippines target to land in the top third of global competitiveness surveys, following the release of the latest results of the Global Competitiveness Index published by World Economic Forum, in which the Philippines jumped six notches to 59th place from 65th last year. Guillermo Luz, Private Sector Co-Chairman of National Competitiveness Council said that the Philippines could reach the top third of the competitiveness surveys by 2016 given the sustained upward trajectory in the following years. "We are just on track to move. Hitting the top forty (40) percent mark is exactly what we have wanted to be, and if we continue this, we should be into the top third and beyond," Luz said. This is the fourth consecutive year the Philippines progressed in the Global Competitiveness Index, which measures the productivity and competitiveness of 148 economies. From its 87th rank in 2009, the Philippines moved two places to 85th in 2010, followed by 10th notches jump to 75th and 65th in 2011 and 2012, respectively, making a total of 28- notch jump in four years. According to NCC, topping the key drivers are the areas of Innovation, where the Philippines' capacity for innovation jumped 38 notches from 86th to 48th, and government procurement of advanced tech products by 22 notches from 107th to 85th. Major improvements were also reported in the area of Institution, in which there are reduced diversion of public funds (from 100th to 79th) and less wastefulness of government spending (from 86th to 63rd). Country's financial market development also gained in the survey with better availability of financial services (from 50th to 40th) and venture capital availability (from 60th to 40th place). Aside from the Global Competitiveness Index, NCC is tracking nine other major global competitiveness surveys, six of which have recorded significant improvements for the Philippines this year. These are IMD-World Competitiveness Report (from 43rd last year to 38th in 2013), Transparency International Corruption Index (from 129th (2011) to 105th (2012)); Economic Freedom Index (from 107th (2012) to 97th (2013)); Travel and Tourism Report (from 94th (2011) to 82nd (2013)); Global Innovation index (from 95th (2012) to 90th (2013)) and Failed States Index (reverse scale from 56th (2012) to 59th (2013)). 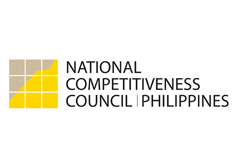 Last January, NCC presented its Gameplan for Competitiveness, a strategy blue print that address areas of concerns in competitiveness surveys through doable programs assigned to different government agencies.